Seriously, you can easily make this bread. The recipe makes two round loaves. It can be halved to make just one if you would like. I made a regular loaf and a garlic salt loaf. The garlic loaf was delicious. You can add any seasonings you like. Cheese mixed in to the dough would also be delicious. The bread is pretty low in calories, delicious, and filling. The bread only takes about 2 hours in total to make. There is no kneading involved, and you don’t even need a mixer to make this. You can do the stirring by hand. This is the easiest bread recipe I’ve seen. So if you are looking for a bread to go with soup, to make sandwiches with, or anything in between, this is a perfect bread for that. The first step is to mix the yeast packet with warm water until the yeast is well dissolved. I used a thermometer to test the temperature of the water, as it should be 100°F-110°F. If you don’t have a thermometer, you just need to test the water on your wrist. As long as the water is warm and doesn’t feel either too hot or cold, it should work perfectly. Let the yeast and water sit for 10 minutes at room temperature, uncovered. After letting the yeast sit, add the sugar, salt, and flour to the yeast mixture. Mix by hand with a spoon until everything is just combined and the flour is well mixed in. Don’t over mix. You want the liquid to be mixed in and no large lumps of flour visible. No need to knead the bread at all. You can mix this by hand with a spoon, so a mixer is not necessary. Let the bread rise until doubled, about 1 hour. Leave the dough in a warm place, uncovered so it can rise. After rising, spread flour on a dry surface. Spray a large cooking sheet or two smaller sheets with nonstick spray. 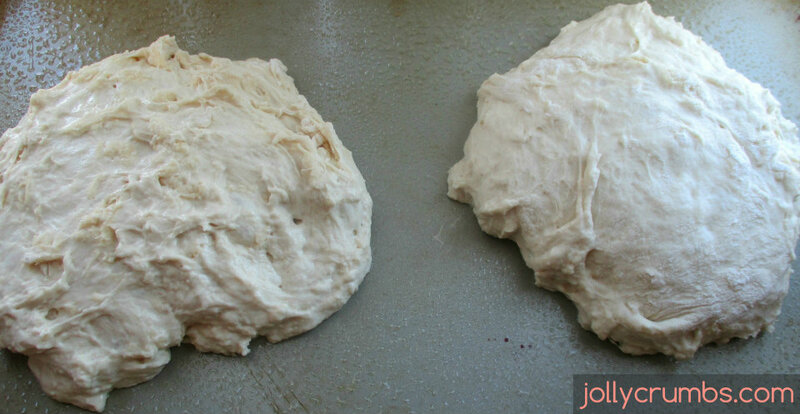 Split the dough into two equal rounds on the floured surface (flour your hands for his part, dough will be sticky). Place both rounds on the prepared baking sheet. Let the dough rise again until doubled, about 30 minutes to an hour. The dough will be sticky, so make sure you flour your surface and your hands before you work with the dough. Preheat oven to 425°F. If you are topping the loaves with garlic salt, brush tops of bread rounds with egg white or melted butter and then sprinkle lightly with garlic salt. If you don’t have a brush, you can use your fingers to spread the egg white or melted butter over top of the bread. You don’t have to add the seasoning to the top of the bread. You can leave the loaves plain, as the bread is delicious without extra seasoning. You can also mix things in to the bread, such as cheese or rosemary. Bake for 10 minutes then reduce heat to 375°F and cook additional 15 minutes or until golden brown. This bread is delicious. I honestly can’t believe it was so easy to make bread. You don’t need any special machines to make it, and it doesn’t require any odd ingredients. I made this bread in the morning, and it was ready by lunch. I enjoyed this bread with some butter for breakfast, and it made delicious sandwiches for lunch. 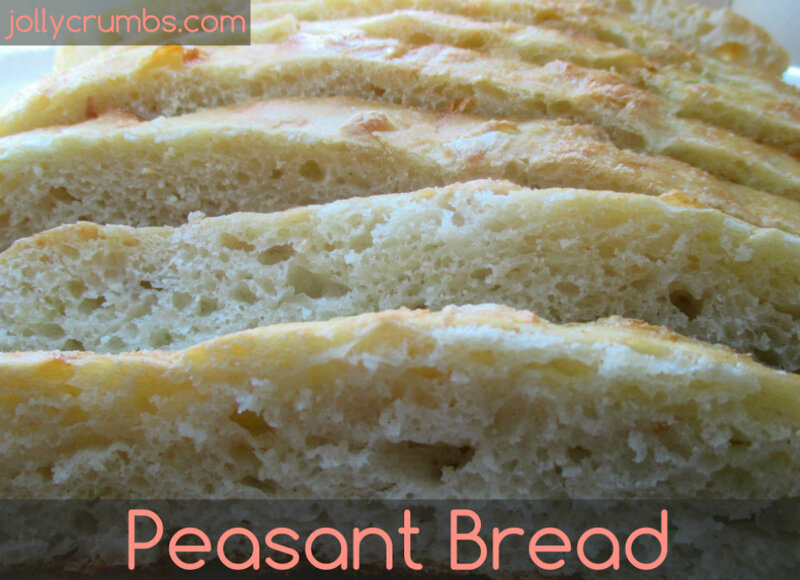 Really this bread is so versatile and delicious. It doesn’t taste overly yeasty. It’s light and delicious. This bread is perfect for any occasion. I will be making this bread as my go-to from now on. It’s perfect and so easy to make. You can’t go wrong here. Mix yeast packet and warm water together. Let sit for 10 minutes. Add sugar, salt, and flour to the yeast mixture. Mix by hand with a spoon until everything is just combined and the flour is well mixed in. Don’t over mix. No need to knead the bread at all. Let the bread rise until doubled, about 1 hour. After rising, spread flour on a dry surface. Spray a large cooking sheet or two smaller sheets with nonstick spray. 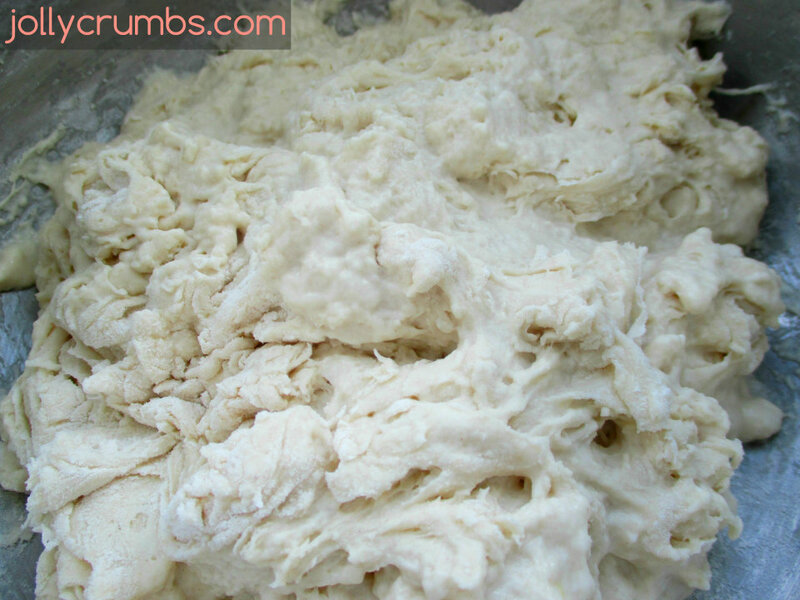 Split the dough into two equal rounds on the floured surface (flour your hands for his part, dough will be sticky). Place both rounds on the prepared baking sheet. Let the dough rise again until doubled, about 30 minutes to an hour. Preheat oven to 425°F. If you are topping the loaves with garlic salt, brush tops of bread rounds with egg white or melted butter and then sprinkle with garlic salt. Bake for 10 minutes then reduce heat to 375°F and cook additional 15 minutes or until golden brown. 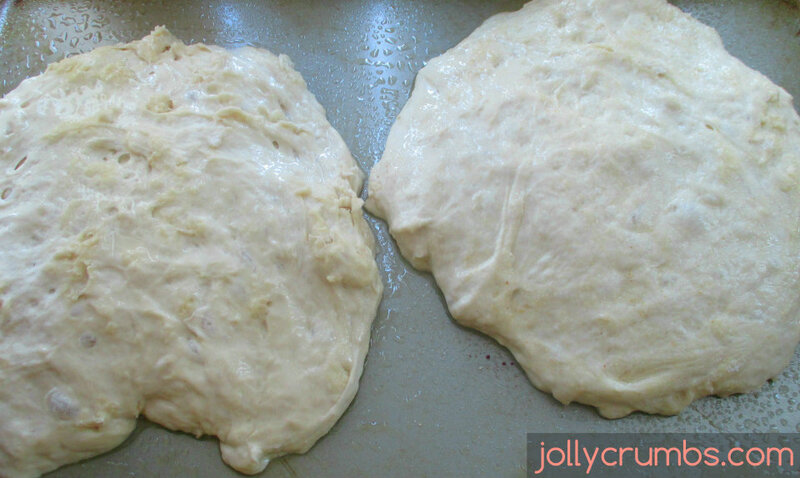 The dough does spread out and double in size when you put it on the baking sheet. If you don’t have a large baking sheet, you may want to use two smaller sheets. 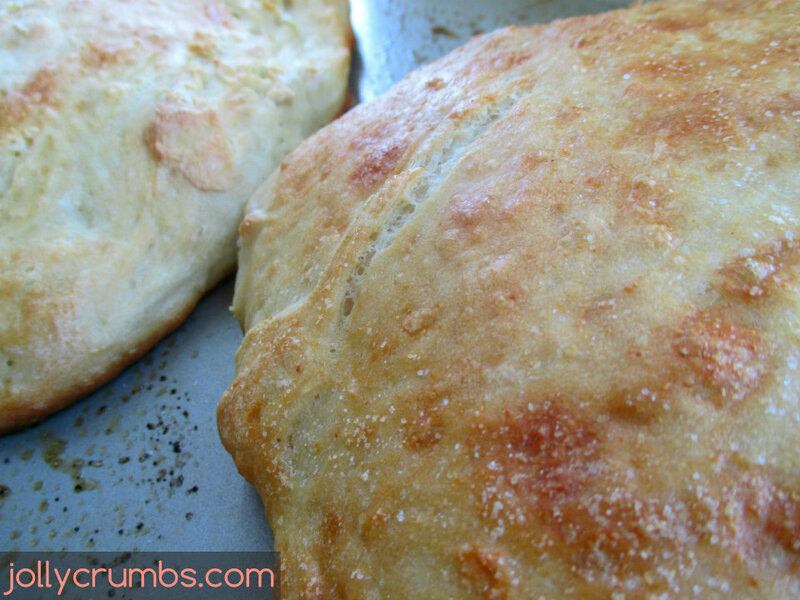 You will need to bake these when they are done rising, so do not refrigerate the dough. I did not cover my dough with anything; I just left it out on the counter in my warm kitchen. The amount of time that the dough takes to rise depends on how warm the area is where the bread is resting. If the dough is not rising, I recommend preheating your oven and letting the bread sit near it. I made a plain bread loaf and a garlic salt loaf. You can add in spices to the bread as well. Or you can make plain loaves. Totally optional to add seasonings. Next time I plan on making a rosemary loaf. Just brush the egg white or melted butter over the loaf you’d like to add seasoning to on top. You can also use your fingers to spread the liquid around on top of the loaf. You will need warm water for this recipe. I used a thermometer, but it’s not necessary. The water just needs to be not hot and not cold. Test the water on your wrist. It should feel warm, but not hot.